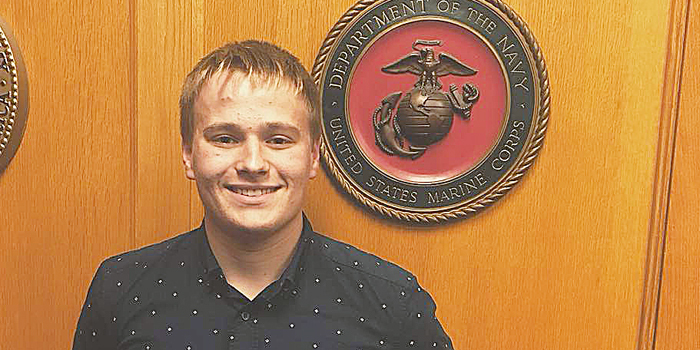 Whitko senior Brad Trump has committed to the U.S. Marine Corps. SOUTH WHITLEY — All veterans are invited to attend the annual Veterans Day celebrations at Whitko Community Schools. Whitko will host programming at all three of its locations — Pierceton Elementary School, South Whitley Elementary School, and Whitko Jr.-Sr. High School. Students have been preparing for weeks, learning the significance of the American flag, what it means to be a veteran, and the local chapter from South Whitley’s Boy Scout Pack 3085 is planning to assist during the presentation of the colors during the program. Veteran guest speakers from the community will also be present throughout the programs and all veterans will be honored. As is tradition, each branch of service will be asked to stand so the community may show their gratitude through applause. Prior to the presentation, a luncheon is planned for all veterans. Attendees should expect testimonials from veterans, patriotic songs from students like “You’re a Grand Ol Flag,” as well as moments of reverence such as a WJSHS band member playing “Taps” on the trumpet. At PES, senior, Brad Trump, will speak about why he wants to be a Marine. Trump recently enlisted with the U.S. Marines Corps in August. South Whitley Elementary School — Friday, Nov. 9, 1:45 p.m.
Pierceton Elementary School — Monday, Nov. 12, 9 a.m.
Whitko Jr.-Sr. High School Luncheon — Monday, Nov. 12, 11:15 a.m.
Whitko Jr.-Sr. High School Program — Monday, Nov. 12, 11:50 a.m.